Cuddled on the majestic ranges of Western Ghats, Rajmachi Fort is a stunning historical fort, that is located just about 95 km from Mumbai and 80 km from Pune. The fort is composed of two citadels, namely, Shrivardhan and Manoranjan. The beautiful fort was built by Satavahanas, but was captured by Shivaji Maharaj in the year 1657. The fort served as a brilliant strategic location, since it overlooked the Bor Ghat, and was an important trade route in the past that connected Mumbai and Pune. The fort went into the hands of Mughals briefly, but after the fall of the Marathas, the fort was completely under the control of the British in 1818. This historically significant fort is now a sought-after destination for trekkers. Trekking clubs mainly from Mumbai and Pune, plan regular trips to the Rajmachi Fort. 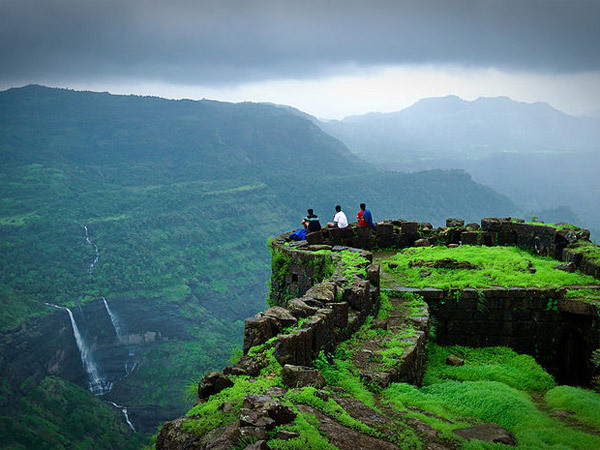 The best time to visit Rajmachi is between June to September during monsoon. The whole landscape will look fresh and make you feel rejuvenated. Trekking can be done during monsoon as well and you might encounter streams of water through the trail. However, if you are a beginner, it is advised to visit Rajmachi post-monsoon, since trekking through such streams might be difficult or dangerous. Navi Mumbai is a city located just 22 km from Mumbai and is the first place that you will find on the way to Rajmachi. This is a planned township by Maharashtra, which has been installed with quite a few recreational places, for the benefit of both tourists and locals. Wonders Park is a park that has replicas of the 7 wonders of the world. Pandavkada Falls is a picturesque waterfall found in Kharghar. Central Park in the main town and Parsik Hill in Mahape are few other points of interest. About 47 km from Navi Mumbai, near the village Khalapur, is Imagica Theme Park. This theme park is an ideal stop for the entire family to have fun. There are family rides like Bump It Boats, rides exclusively for kids like Magic Carousel and thrilling rides like Scream Machine. The park also has a restaurant and resort so a one-day stop can be made here. Khandala is an enthralling hill station and one of Mumbaikars' favourite places of vacation. It is located 24 km from the Imagica Theme Park. Packed with the natural beauty of the Western Ghats, Khandala is dotted with peaks, viewpoints, lakes and caves to explore. Tiger's Leap, Amrutanjan Point and Duke's Nose are the three main viewpoints of Khandala, that offer a spellbinding panoramic view of the entire hill station. Bhushi Lake, Karla and Bhaja Caves are also some places that must be visited here. Like previously mentioned, the magnificent fort of Rajmachi was built by the Satavahanas and was later under the reign of Shivaji Maharaj. It is located about 13 km from the picturesque hill station of Khandala. Manoranjan Fort, one of the two citadels of Rajmachi, is perched at a height of 2700 ft, while the Shrivardhan Fort is at an altitude of 3000 ft, making it the vantage point. Karnala Fort can be viewed from the top of these fortresses. Although the fort is now in ruins, it has a vintage, rustic look that makes us travel back in time. Located about 3 km from Rajmachi Fort, Kondana Caves are a group of 16 Buddhist caves that were first excavated in the 1st century BC. These mountain caves are one of the most popular caves to explore near Mumbai. While trekking up to the Rajmachi Fort, trekkers commonly visit the Kondana Caves as well since it is 3 km away by foot. To reach the caves from the fort by road, you need to take a huge roundabout of 68 km. There are two trekking trails to the Rajmachi Fort. The easier one that takes a day is the trail through Lonavala. This trek can be extended to a two-day trek by camping in either one of the two fortresses of Rajmachi. It is an easy and well-defined 16 km trek since most of it will be hiking through flatland. The trek begins at the Rajmachi village and ends at the fort. After camping there for a night, you may return through the other trail, and that way you can even visit Kondana Caves. The slightly tougher trail is the one via Karjat. This is also a one-day trek that can be extended to two, depending on whether or not you intend to camp. This is a rocky trail that begins from the Udhewadi village. The trail might have many waterfalls and small streams during monsoon so it advised to go along with a professional trekker or avoid trekking in monsoon. The first place to reach through this trail is Kondana Caves. After resting here for a bit you may proceed to the Rajmachi Fort.